Come and relax at our rustic hunting lodge and get away from it all! Our lodge was built over 60 years ago and is family owned and operated. We are a full service hunting lodge with guided hunts for wild boar, ram, goat, deer, elk and buffalo on over 2000 acres. During our slow time for hunting we offer our lodge out for rent. The rooms are like a hotel, each room with its own private bath. We have 10 bedrooms in the lodge. We have rooms with a king, queen, double and bunk bed rooms. We can sleep 32 in all. Do something different and come enjoy the peace and quiet of the wilderness. You are also welcome to fish in one of our three lakes during your stay with us. We are located only two miles off I-40 (Plateau Rd, Exit 311) in Crossville TN. Crossville is the golf capital of Tennessee with over 14 golf courses with just a few minutes drive. My husband and I recently stayed at the Lodge for my birthday weekend. The southern hospitality and cooking made our stay incredible. The high end furnishings of the rooms were better than resorts we have stayed at! The staff and owners of the resort treated us like family, and very helpful with area attractions (winery tour, shopping, dinner) The lodge stay was an incredible memory and we will for sure bring our kids back - they have bunk rooms for the kids - or perhaps we will stay at the newly built cabin - which we toured and is amazing! This place would be perfect for small or large groups! Thank you so much. We hope that you had a enjoyable and relaxing birthday getaway! We would love for you to bring the kids next time. 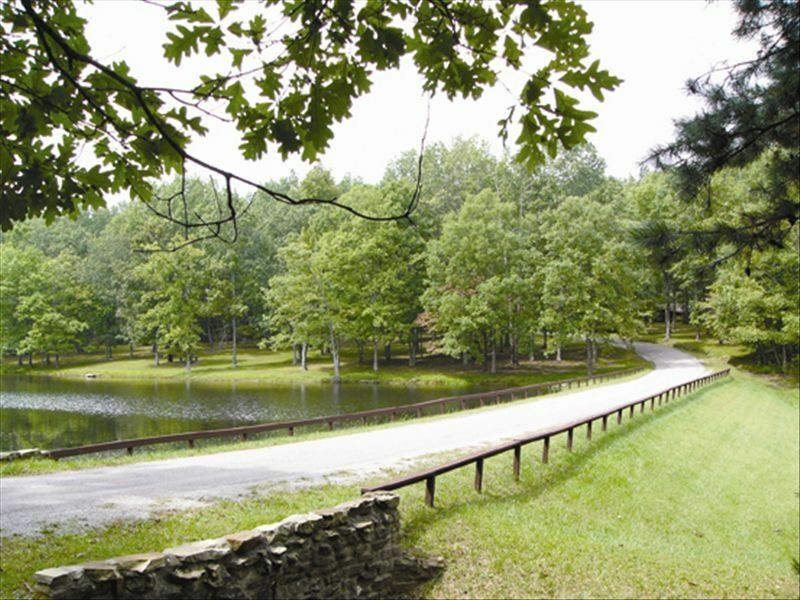 They would have a blast fishing in the ponds, discovery the wilderness on a hike, roasting s'mores at the fire pit or taking a horse-drawn wagon ride. Hope ya'll come back to see us again soon! This being our first VRBO experience, we didn't know how it would stack up against hotel stays. Any concerns quickly disappeared as we found the accommodations well above expectations and hosts personable and helpful. Walking into the lodge was like walking into a different world: taxidermied animals/heads adorned the floor/walls (what a great educational opportunity!).... the richness of the leather furnishings begged to be used.... the tables, arranged for great group dynamics..... All of our worries were left behind. We rented three rooms and found them comfortable, well-maintained with high end mattresses, linens, and beautiful stone (bathroom). We had no worries about leaving our teenaged children in the next room. We appreciated that not all rooms were furnished with tvs, but that a 'tv room' was available for enjoyment. It felt good to be unplugged from the outside world. Our hosts were on-site, and provided excellent dinner recommendations; additionally, we were treated as if we had known them for some time as they shared the history of the property as well as what animals could be hunted on the premises. We were completely put at ease and made to feel welcome. We appreciated the tour of the large cabin across from the lodge and are making mental notes of when we might return to rent it! This has been the highlight of our summer. If you are looking to have a memorable experience, you will have found it here! Will we be back? Most definitely, and with our camera! Oh thank you so much. I am so glad you enjoyed your stay with us while visiting the Cumberland County Playhouse. It is much more fun to stay with us than in a hotel. Your group was such a delight and a joy. We look forward to having you stay with us again in our lodge or in our brand new luxury cabin. See yall soon! This was a wonderful 5 STAR stay. We love our accomodations and the warmth that was shown to us from the owners. Thanks guys for making us feel so at home with your family. The race was great Kyle B did not win (yes), however Dale Jr did not either (sad). Good luck with the new IPAD and your daughter. We will be back again every time we go to Bristol. Thank you so much for helping us make our 2nd Family Reunion (and celebration of my Dad's 80th Birthday) such a success! From my first inquiry through our entire stay we received excellent, friendly and personal service. The new cabin is exceptional and of the highest standards - top quality from the linens, bedding and furnishings to the fully equipped kitchens. We were a group of 22 (from 5 - 81 yrs) and everyone enjoyed the entire stay! Kids kept busy with fishing, toad catching and even a game of corn hole- when they could talk the adults into giving them a turn! We had a group that enjoyed golfing at a couple of courses nearby while some of us spent time in Crossville doing a little shopping and sightseeing. :) The outdoor kitchen was great for grilling brats and cooking our Low Country Boil. I feel certain that anyone choosing to visit Crossville couldn't go wrong renting this beautiful cabin! I would recommend this place to families and even couples..I just recently had a family reunion here and the accommodations were great..Watching the kids fishing was great..The outdoor pavilion provided enough room for us to eat together..Bobbie Jo and her husband were so friendly and always there when we needed anything..The house was so clean and have the double kitchens really helped when we were trying to prepare food..I would definitely recomment this property to friends and to anyone who is looking for a nice place to relax and enjoy the outdoors...Having the rocking chairs on the porch and being able to sit outdoors and enjoy the air was enjoyable..There is not alot of traffic that you hear..There was shopping and places to eat that were maybe 10 to 15 minutes away..
What a great place to stay! We enjoyed the beautiful bedrooms, large common rooms, extremly clean, friendly staff and owner/family who always provide the extras. I would like to keep this retreat to myself. Thanks again and look forward to a return stay. Carol-- Thank you so much for staying with us during Hwy 127 World's Longest Yard Sale and also for your great comments. We are so glad you found our wilderness retreat and were able to relax after a hard day of shopping. Can't wait til you guys come see us again.